Here a new acquisition - an Elma Super Elite watch cleaning machine - to speed up the cleaning procedure of my disassembled timepiece movements (it sometimes took me several hours to clean all the parts / building groups which could really be annoying as I needed a combination of mechanical brushes and chemical solvents for this...). The machine looks somewhat strange (ugly?) when you see it for the first time. The column in the middle (1) holds the status controls for the heating (left switch with red status lamp) and the motor (right switch). The knob on top is for regulating the motor speed. The golden plate covers the opening for an optional timer unit. Additionally there are the motor unit (2) which is mounted on a sliding shaft (3), three glass jars for cleaning solutions (4-6) and a heating tube (7). The filled basket is than attached to a corresponding mounting under the motor unit. The latter features suction blades that create a liquid stream through the basket when it is submersed (ca. 1-2 cm deep) and then turned with the motor (low to half speed maximum). Cleaning starts in the left jar (4) for three to five minutes (Elma 1:9 cleaning concentrate - concentrate 1 : 9 tap water, two marks on the jar show the correct fill heights). After that the basket is moved out of the liquid and centrifuged for 30 secs on full speed to get the liquid out of it. 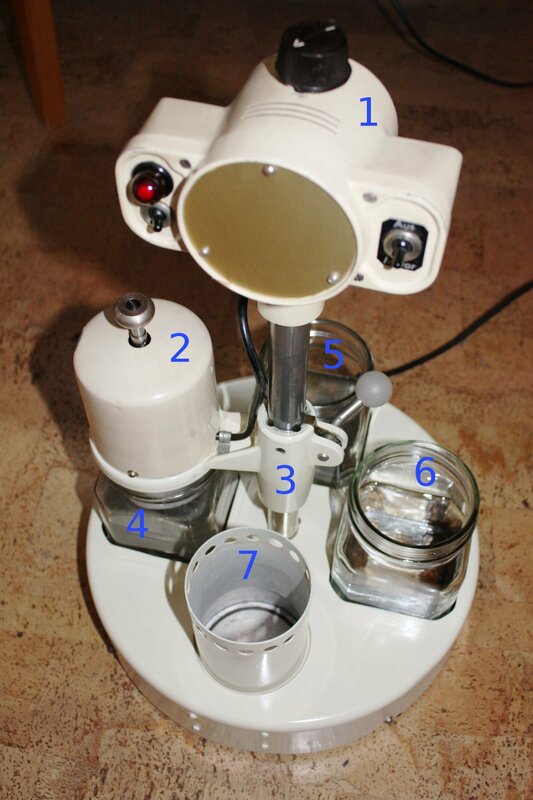 The complete procedure is then repeated with the second jar (5) which holds distilled water and the third jar (6) which holds Elma Suprol solution. Finally the basket is moved to the already pre-heated heating tube (7) where it is centrifuged for some minutes to get everything completely dry again (Elma Suprol is quite volatile and should disappear without traces). After the last stage the movement should be quite if not perfectly clean already. 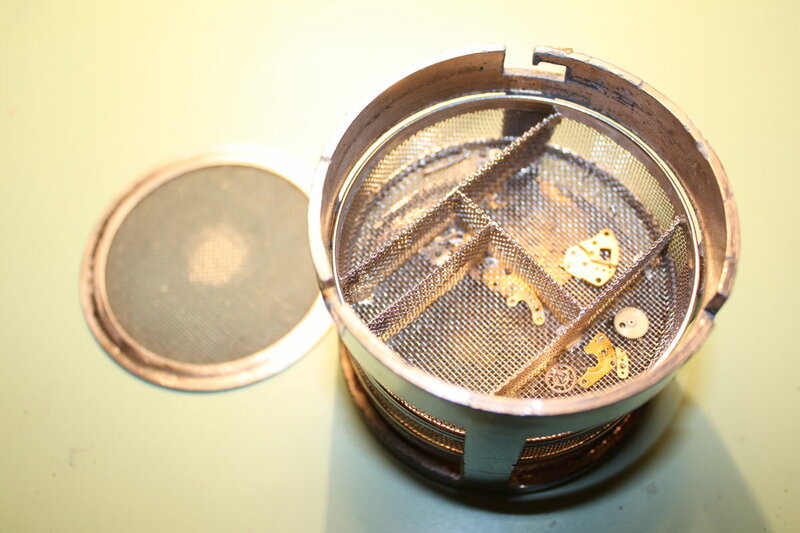 However, it might still be necessary to remove some rust and other remaining grease / dirt (if not happened already before all this -> I recommend a good inspection under the loupe before and after the cleaning procedure). Compared with the manual cleaning of a watch movement, this machine is very fast, effective and actually - fun.